In London, Does The Night Still Exist? Londonist In London, Does The Night Still Exist? Image by DICKSDAILY in the Londonist Flickr pool. 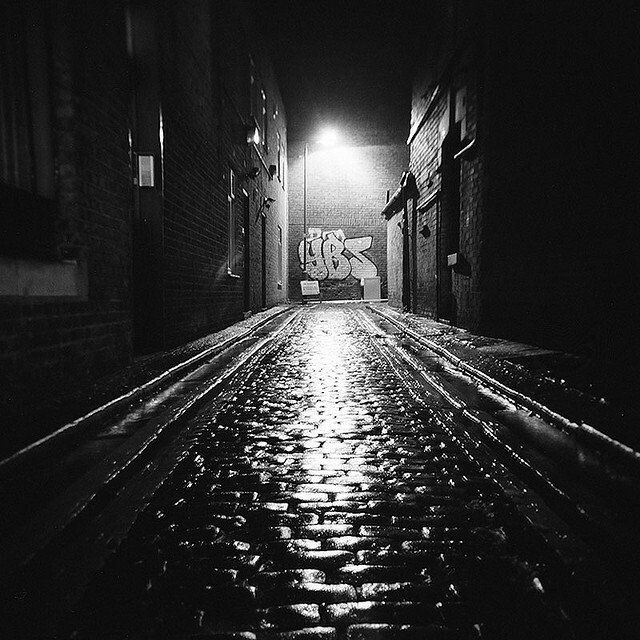 Will Rees takes a night-time stroll through the capital, following in the footsteps of Charles Dickens. Stare up at London’s night sky and you don’t see celestial lights twinkling from on high, glimmering hints of other worlds. Instead you see a murky mirror stretched tall over roads and rooftops, reflecting back the light with which we drown out the darkness surrounding us. We used to look up at the sky and behold the Infinite. Now we see only ourselves. Has every shadow been dissolved? Have we erased the night? Have we drowned the world in light and created eternal day, a metropolitan polar-summer? Or else, beneath the light pollution, the reassuring glare of street lamps and the 24-hour hum of supermarkets, chicken shops and late kick-out clubs does there quietly continue a nocturnal world? One that escapes us, retreats from view and remains out of focus? Following in the footsteps of greater writers, I sought to answer these questions. That’s why, armed with a copy of Dickens’s The Uncommercial Traveller and a few half-baked and borrowed ideas, I set out one cold March night — a self-ascribed somnambulist in search of London’s secret life. Ever the amiable companion, Dickens provided inspiration, guidance and sympathy. ‘The month was March', I read while glumly contemplating the elements, 'and the weather damp, cloudy, and cold'. Leaving my house in SE5 I walk north towards the Thames, cutting a diagonal through Burgess Park, before heading up through Rotherhithe. It isn’t until I’m in Bermondsey that I see another person, a young bespectacled man with an apologetic smile. He checks his phone, then crosses the road to avoid the clash of our gazes. Around 2am I arrive at my first destination, Brick Lane Beigel Bake. Serving salt beef beigels 24 hours a day, 7 days a week, it’s the perfect pit stop for a late night dérive. Newly sated I head west. As I round a corner near Liverpool Street I hear a deathly scream — the sound of cutpurses, knaves, murder. Then I see it: two reynards in battle, fighting for the paw of a third, the vixen. She watches on, eyeing her suitors scrupulously and dispassionately. Urban foxes are the guardians of the irrepressible. London was home to 33,000 on last count. The population can’t be controlled, though efforts have been made. It’s no wonder we hate foxes; they’re an affront. Like moss growing through paving slabs, they’re ciphers of an untameable world overflowing our attempts to supress it. Foxes are spectres: ghosts of past, and of future. They remind us that our control is slipping. I turn away and leave them to their business, their ancient rituals casting strange shadows against the cold and glassy skyscrapers. In the dark you see the most familiar places in a new light. Take, for example, Oxford Street. By day it’s bustling and frenetic, almost unbearable. By night it’s serene. Strolling past department stores I feel myself enshrouded in a gentle blue mist. Away from the eyes of the desiring masses, window displays that by day attract or repulse us fall dumb and mute and look impotent and strangely melancholy. It’s almost beautiful. I turn around and walk south-east, through Soho and towards Smithfield. A livestock and then meat market for almost 1,000 years, and the site of countless executions, it’s surely the bloodiest place in London. Still today the smell of flesh is overwhelming. But now is not the time for meat. Now is the time for coffee. As luck would have it there is coffee to be had. And while it’s not as good as in Soho’s Bar Italia (open through the night), it’s an altogether more interesting experience to imbibe one’s caffeine in a place where cadavers outnumber the bodies of the living. The London we experience every day is an illusion, a great collective dream. Without their knowing it, the city of eight million Londoners is reset every time they go to bed. This requires significant effort. Night time itself must be scrubbed from the pavements. As I walk north, I see that an army is hard at work. In their sun-bright fluorescent clothing they are guardians of the day, working through the night to erase any evidence of the city’s duplicity. Soon the dreamers will awaken to find their city just the way they left it. They will imagine that it is always thus. As I walk north, past Euston and Mornington Crescent and into Regent’s Park I realise it’s getting lighter. The sun hasn’t breached the horizon but already makes its presence felt. From Primrose Hill I watch it rise high over the downcast eyes of the capital’s commuters. It’s time to go home. London sleeps. But that sleep is restless; those dreams are troubled. Walking at night reminds us that all things we consider familiar have simply had their corners rounded by daily handling; have had their strangeness supressed by the bromide of routine. 'Prayer is the true language of the night. It is the sound of London’s heart beating', writes Sukhdev Sandhu, in Night Haunts. For my part I don’t hear prayer, but ghosts. London’s night is full of ghosts. Of people, certainly. But also of the city that once astounded us — once unsettled and enticed us. It’s a London that still exists, if only we prick up our ears and listen to its groans and wails, faintly audible beneath a cacophony of more familiar sounds. Then we might find that it follows us, denuding itself of shadow and pursuing us right through the day. Bleary-eyed and exhausted, furtively sipping a coffee on the 176 bus amid the thrall of commuters and early-rising public school kids, I think of one of those greater writers. One can also speak of different forms of night that occur right in the daytime. Illuminated objects can appear to us as though in twilight shapes. Like the unreal, inverted city we find after an exhausting trip, things and beings strike us as though they no longer composed a world, and were swimming in the chaos of their existence.